Fate (aka the APQ UFO Challenge) has thrown me an easy challenge for the month. Number 8, the smallest and only mini quilt on my list, was chosen for this month. This is so welcome after a very busy and stressful January, combined with the fact that I'll be out of town for QuiltCon at the end of the month for five days. Plus short month. I made these blocks way back when I made my mini for the Cotton and Steel Mini Swap. I can't believe that was a year and a half ago. These blocks were designed to create five 8" finished blocks from five 10" squares. I could finish this project up by simply adding triangles to square it up into a mini quilt, but as I think about it, I'm considering other options. Unfortunately, most other options would create more work for me. I do have the remainder of the layer cake from this fabric line still. I think I may aim for a baby quilt. I'm linking up to the OMG February Goal Setting Link Up. Posted in Quilting. Tags: One Monthly Goal, UFO Challenge on February 4, 2017 by sarah. These are great looking blocks. Good luck figuring out a plan. I hope to run into you at Quilt Con Sarah. Good luck with the baby quilt. The fabrics are great. Thank you, Lisa. 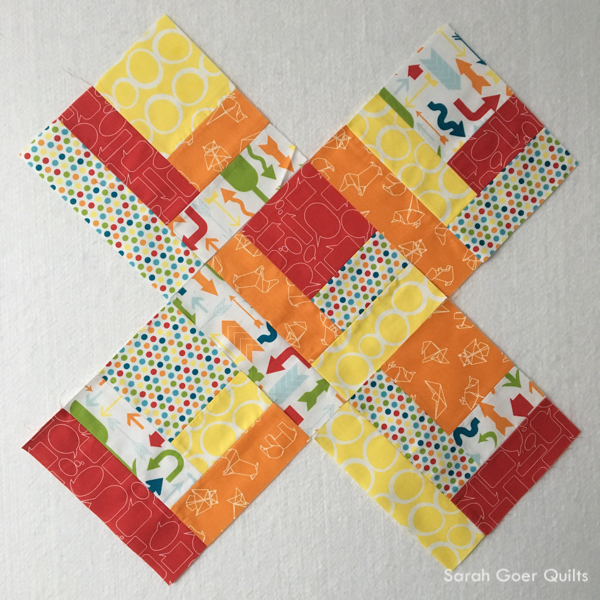 Are you taking classes or attending lectures at QuiltCon? What a fun and colorful set of blocks...oh the possibilities. I look forward to seeing how you finish these this month! Yay QuiltCon! :-) Thank you, Patty. It feels good to be making progress on old UFOs. Thanks for the inspiration!